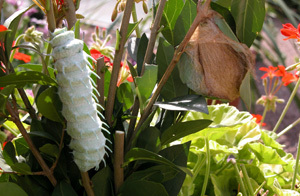 The butterfly garden is a member of the International Association of Butterfly Exhibitors; an association working for the protection of tropical forests by developing breeding grounds for butterflies in their native countries. Today, and with our contribution, this means that major biological and entomological research programmes may be carried out. We are only just starting to learn about the world of butterflies. Through this action, more than 2000 families of breeders can live in decent conditions in these developing countries, instead of having to cut down tropical forests.